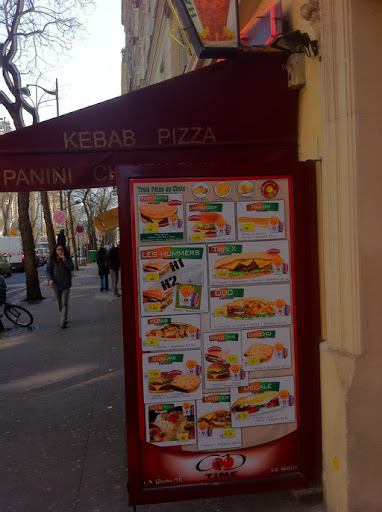 The kabob is the French equivalent to the cheese steak. They put the kabob meat in a baguette and if you ask for a kabob avec salad they ads lettuce and tomato. They give you a choice of 4 sauces; A hot sauce, a yogurt sauce, a creamy herb sauce, and a Russian dressing type sauce called americane ( guess it's based off of special sauce). Ask for ketchup on the fries and they seem shocked. When they do they shoot a puddle in the corner of you fries like you might like some fries without it! They have a banging grapefruit soda from sweppes I wish we had though.